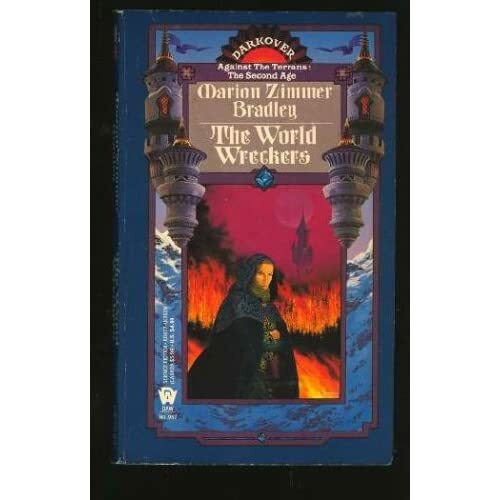 The World Wreckers, by Marion Zimmer Bradley: Darkover. A lost colony of Earth from before there was an interstellar Terran empire. Darkover went low-tech and developed telepaths and when the Terrans rediscovered Darkover they found that Darkover wanted nothing to do with the Empire and greatly restricted the level of contact between the planet and the natives. Some seventy years after rediscovery an illegal Terran company, unofficially called Worldwreckers, Inc, has been hired by certain companies to go in and wreck Darkover’s economy and ecology in such a way that Darkover will be forced to petition the Terrans for help and open up the planet for unrestricted trade and industry. Meanwhile, Darkovan telepaths, in particular the Comyn ruling class, are targeted for assassination and the loss of the telepaths could be a killing blow for Darkover because their economy and technology is based on telepath technology. Regis Hastur, ruling Comyn lord, attemps to gather as many telepaths as possible to him – from Darkover and from the Empire, to build a new Darkover and to remain independent. The World Wreckers is a shorter Darkover novel, it moves fast, and is as clunky as the average Darkover novel has been. Zimmer Bradley can be heavy handed with her storytelling, romances, dialogue, and interactions. And yet, The World Wreckers was a pleasant enough story to read. It added very little to the overall scope of the series, though hopefully it impacts later volumes. It isn’t a good book, or one truly worth recommending, but I have been reading Darkover for years and have found enough enjoyment in Darkover that I want to read the rest. Darkover works better as concepts than as actual prose, but somehow the books tend to overcome the clunkiness. The Stand, by Stephen King: 1100+ pages of post apocalyptic vision. This is the unabridged, expanded, updated, all new version from 1988 which brought The Stand back to its original glory. When it was published in 1978 The Stand was the victim of the publisher’s accountants who required the novel be cut in half for publication based on sell price and projected sales. This new volume gives King’s full vision. It starts with a virus on a military base and from one man spreads to infect a world. The virus has something like a 97 or 99% mortality rate and for the first several hundred pages we are introduced to the spread of the virus, watching towns and cities collapse and see how it spreads, how one person can infect many and how a virus can spread like...wildfire. But some people survive and we are introduced to some of those characters early. Then they gather, through accidents and visions of an elderly woman and the “Dark Man”. What follows is a battle of good versus evil, of the future of humanity and the evil inside us all. The Stand, in this format, is a serious time investment. It also may be Stephen King’s greatest, and most ambitious novel. I suspect, however, that the edition as published might be better than the expanded edition because over the course of 1100 pages I was unsure of when King would get to the point and when the story would advance. But that’s not what the 1100 page behemoth is about, this volume is about fleshing out the characters and making a richer reading experience. It is a rich reading experience, and the 1100 pages are far more focused than 500 pages of Lisey’s Story (for example), but the length and the leisurely time King takes during the middle sections might be a turn off for some readers. That would be a pity, because The Stand in all its full and fat glory is a beautiful post apocalyptic beast of a novel. Well worth reading, though perhaps 900 pages would have really nailed it down. Pat's Fantasy Hotlist interviews Katherine Kurtz!